How new is atheism? Although adherents and opponents alike today present it as an invention of the European Enlightenment, when the forces of science and secularism broadly challenged those of faith, disbelief in the gods, in fact, originated in a far more remote past. In Battling the Gods, Tim Whitmarsh journeys into the ancient Mediterranean, a world almost unimaginably different from our own, to recover the stories and voices of those who first refused the divinities.Homer’s epic poems of human striving, journeying, and passion were ancient Greece’s only “sacred texts,” but no ancient Greek thought twice about questioning or mocking his stories of the gods. Priests were functionaries rather than sources of moral or cosmological wisdom. The absence of centralized religious authority made for an extraordinary variety of perspectives on sacred matters, from the devotional to the atheos, or “godless.” Whitmarsh explores this kaleidoscopic range of ideas about the gods, focusing on the colorful individuals who challenged their existence. Among these were some of the greatest ancient poets and philosophers and writers, as well as the less well known: Diagoras of Melos, perhaps the first self-professed atheist; Democritus, the first materialist; Socrates, executed for rejecting the gods of the Athenian state; Epicurus and his followers, who thought gods could not intervene in human affairs; the brilliantly mischievous satirist Lucian of Samosata.Before the revolutions of late antiquity, which saw the scriptural religions of Christianity and Islam enforced by imperial might, there were few constraints on belief. Everything changed, however, in the millennium between the appearance of the Homeric poems and Christianity’s establishment as Rome’s state religion in the fourth century AD. As successive Greco-Roman empires grew in size and complexity, and power was increasingly concentrated in central capitals, states sought to impose collective religious adherence, first to cults devoted to individual rulers, and ultimately to monotheism. In this new world, there was no room for outright disbelief: the label “atheist” was used now to demonize anyone who merely disagreed with the orthodoxy—and so it would remain for centuries.As the twenty-first century shapes up into a time of mass information, but also, paradoxically, of collective amnesia concerning the tangled histories of religions, Whitmarsh provides a bracing antidote to our assumptions about the roots of freethinking. 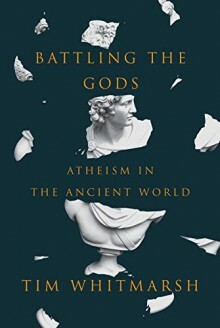 By shining a light on atheism’s first thousand years, Battling the Gods offers a timely reminder that nonbelief has a wealth of tradition of its own, and, indeed, its own heroes. http://Jaylia3.booklikes.com Reflections 4.0 Atheism in the ancient world? text Atheism in the ancient world?